You don't need to buy lumber that has already been straight-edged. Buy rough lumber and cut the straight-edge yourself with a table saw. It's a simple procedure that can save you money. You don't need any special tools and you get a clean edge. It only takes a few minutes to straight-edge any piece of lumber, and you can choose to cut out defects as you go, giving you more flexibility. Lay the board out on top of your table saw. Sight down both sides of the board. Look for the curve. One side of the board will have a slight bow in it, or "crown." Flip the board over so that the points of the crown are facing the fence. Think of it as a "C" shape. The points of the "C" should be facing the fence. Measure from the fence across the board to the widest point on the outside of the crown. Set the saw at 1/4 inch less than the measurement. Hold the board with both hands. Your right hand should be behind you holding on to the board. Your left hand should be in front of you holding the board against the fence. Turn on the saw and push the board into the saw blade holding it as straight as you can. Push the board forward. The leading edge of the board will probably not contact the blade at all. Keep pushing the board forward until the blade makes contact with the outside edge of the crown, the round part of the "C" shape. Push the board through the saw cutting the round outside edge of the "C" off. Move the fence over 1/4 inch closer to the blade. Cut another slice off the outside edge of the crown. If the board is not straight along the outside edge, move the fence over 1/4 inch at a time and re-cut until the board has a straight edge the length of the board. It's a good idea to flip the board over, reset the fence and cut the inside points of the crown off. This final cut is usually the straightest and most accurate. Freehand straight-edging should only be attempted by confident, experienced woodworkers. 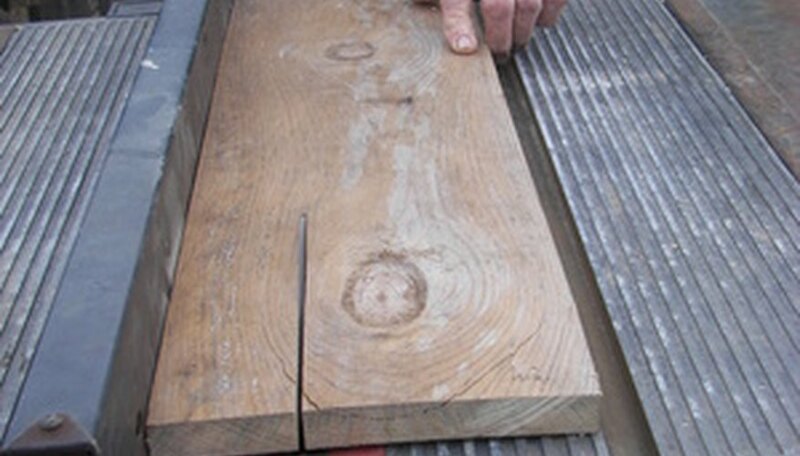 Lumber kickback can occur if the board is inserted or pushed at an angle to the blade.